There’s something reassuring about digitally stored photos. Unlike the ones we used to stow in shoeboxes and albums, they can remain available, searchable, easily accessible, and un-degraded. Until you delete them. Then your most-precious memories may be gone for good. If you delete media from an iOS device, you may be able to recover them, especially if you act quickly. Are they in the Recently Deleted album? Are you using iCloud Photos? With iCloud Photos disabled, did you sync via iTunes? With iCloud Photos disabled, do you have an iOS backup? 1 Are they in the Recently Deleted album? 2 Are you using iCloud Photos? 3 With iCloud Photos disabled, did you sync via iTunes? 4 With iCloud Photos disabled, do you have an iOS backup? iOS moves deleted images and videos first to this temporary holding place for about 30 days. If you check there before 30 days is up, you can select and restore them to the main photo area. However, if 30 days has passed or you manually deleted them from this folder, you have to try a different method. The Recently Deleted album holds just what the label promises (images up to 30 days old). You can browse the folder and restore its images. iCloud Photos synchronizes your images across all devices logged into the same iCloud account (iOS and macOS) and which have iCloud Photos enabled, as well as making them available at iCloud.com. 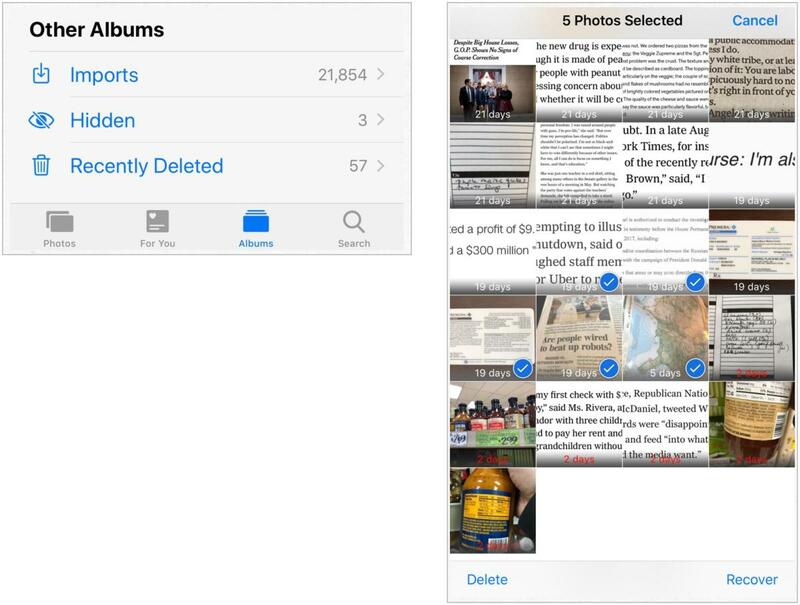 iCloud Photos also uses the Recently Deleted album as a holding place. 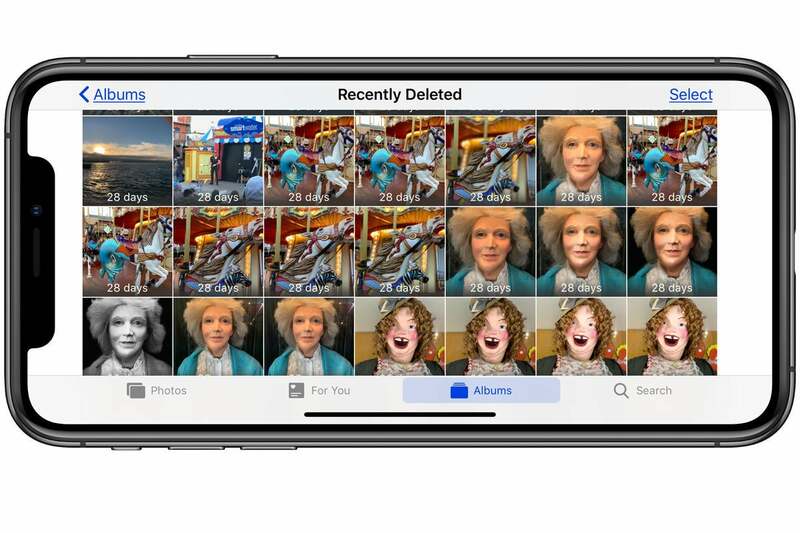 However, we have heard from several readers that Apple may able to restore images deleted from iCloud Photos within a short period of deletion. Visit Apple Support and file a customer-service request. With iCloud Photos disabled, you can sync media from your iOS device to iPhoto or Photos in macOS, as well as to folders with iTunes for Windows. Depending on your settings, you may have copied images from your iPhone or iPad to your computer automatically. Check your photo app of choice to see if the images are there. If so, you can create an album in that photo app and use iTunes to sync the album back to your phone or tablet if you also want the images there. You can restore a backup onto your device and recover those missing photos and videos, but you’ll also overwrite anything newer than the backup, so sort this out wisely. With the current state of your device, archive all its media, so it’s not accidentally lost in a restore. Use iPhoto, Photos, or Image Capture to import images and movies you don’t already have a copy of onto your Mac, or use iTunes for Windows to copy into Windows. Perform a manual iCloud or iTunes backup operation to have an up to date backup of the current state of your device. Restore an older iCloud or iTunes backup that you’re sure is at a point before you deleted the media you want to recover. After the restore is complete, make a backup as in step 1 of all the recovered images and videos. Now, optionally, if you want to get back to where you were before the restore, use a later iCloud or iTunes backup to restore a later state. This Mac 911 article is in response to a question submitted by Macworld reader Michelle.